On November 11, 2010, which is Veterans Day, Troop 101 was asked to help out the Marine Corp League when they did presentations at local medical clinics in town. 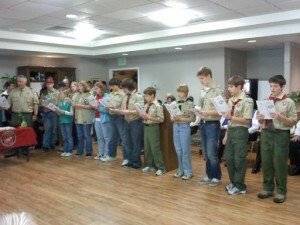 The League did some flag ceremonies, and the Troop 101 “singers” did quite a few patriotic songs. During the singing of the Marine Corp Hymn, the men of the Marine Corp League were very eager to jump right in and sing along with us. Special thanks to the fine young ladies who came along with their brothers and joined in with the singing! Other pictures are posted in the photo album. Click on the Gallery link above. This entry was posted in Uncategorized and tagged Day, flag ceremonies, Hymn, League, Marine, marine corp hymn, marine corp league, medical clinics, patriotic songs, singing. Bookmark the permalink.